Its always difficult to find recipes, especially for baking, that retain the texture and taste without eggs.Oatmeal cookies are not only eggless but also make for simple,tasty & easy cookie recipes for adults as well as kids. we are fond of cookies that’s true. Usually i will buy oats cookies from store but today i made it.We can make this with whole wheat or multi grain flour or millet flours. Adding oats in cookies we can feel the chewy ,crunchy bites of cookies .There are few eggless cookie recipes posted on the blog. since i often bake cookies without taking pics. As i said these cookies are very healthy we can pack this as a snack for kids and also i love to serve it with milk.It’s a yummy and delicious combo,do try it. Grind the sugar into fine powder to reduce the processing time.I have used the instant fruits and nuts oatmeal ,if you didn’t get it you can add the oats,fruits and nuts of your choice. Just crush it in the processor ,before using it. Try to use the butter at room temperature. If you wish to add nut meg powder you can add it too.Lets proceed with the recipe. In mixing bowl, add flour,oatmeal, baking powder and salt. cream the butter and sugar until it turns light and fluffy.knead together with the flour until combined.If dough is so tight add milk and adjust to make it like cookie dough consistency. 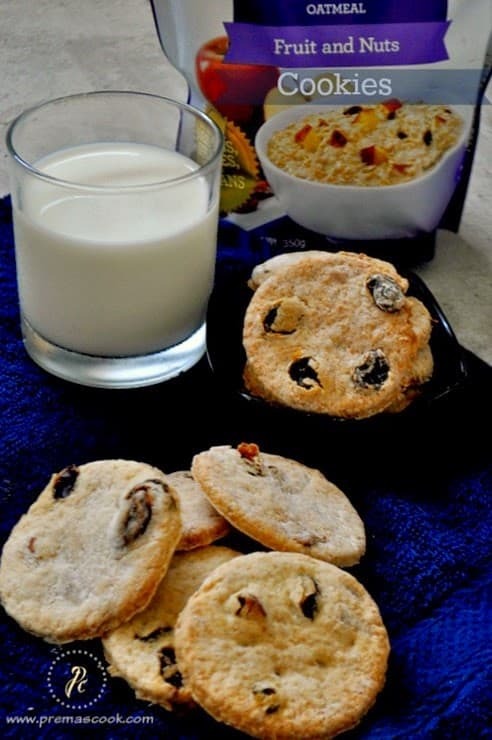 sounds super quick oats cookies….healthy option compare to store bought cookies…. Cookies look absolutely fantastic!! 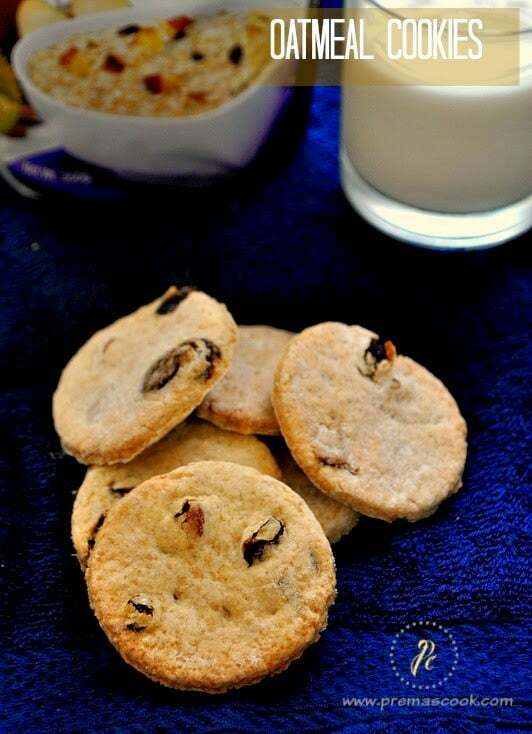 Love the fruit and nut combo..
grt one.. i always hv a special love towards fruit n nut biscuits n tis one is perfect one..
Lovely bunch of cookies made so healthy!